A cable-free electronic paper display with full CMS integration and up to a year of battery autonomy. Introducing Place & Play, effortless to use, with not a wire in sight. Be among the select few to join the Early Adopter Program and help shape the future of signage! Keeping things simple often turns out to be the most complicated task. At Visionect, we believe that digital signs should be effortless, fitting seamlessly and without hassle into any industry and any use case. Our goal is to avoid the complexity that digital signage often falls prey to, from tricky installation to intricate integration, customization and content management. You can now help us refine all that signage should be. Place & Play is the new digital sign from Visionect, the latest in the line of our pioneering electronic paper solutions, created to counter the convoluted signage process by combining mount, display and player in a single digital signage device. Just as effortless to use as the name suggests, Place & Play is easily installed on all indoor surfaces and is usable straight out of the box. And the best part: there isn’t a single wire in sight. Place & Play is the only all-in-one digital signage device combining mount, display and player. Meticulously built for a seamless look and feel, Place & Play is where award-winning design meets sustainability. Enclosed in a precision-brushed aluminum casing with built-in magnetic VESA mounts, the sign is enforced with the most durable glass pane to protect from scratching and hazing, and boosted by an ultra-low power consumption that is 99% less than that of LCD or LED. In fact, the energy use of the device is so negligible that the Place & Play can work for up to 12 months on the energy it takes to brew a single cup of coffee! 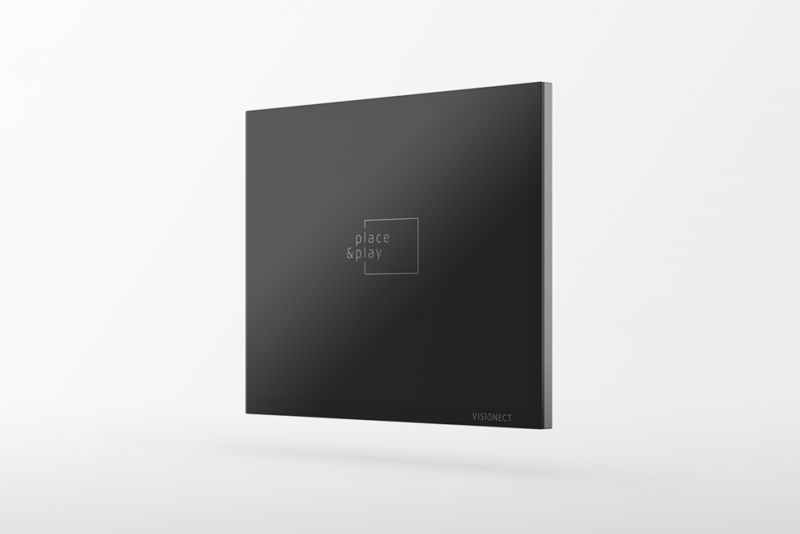 Unparalleled when it comes to visibility—think 16-level grayscale, a resolution of 1600 by 1200px and an 180° viewing angle, all thanks to E Ink®’s display—Place & Play works without complex installation or customization. Connecting via Wi-Fi and supporting full content management system (CMS) integration, the Place & Play will display any web link in just a few clicks, delivering real-time information across locations and industries. Airports, hotels, offices, restaurants, banks, museums, shops, hospitals, schools, you name it. Getting your message out becomes a simple matter of place & play. And you can now add your voice and experience to tell us exactly how this message should be delivered. Set to make its public debut this fall, Place & Play will be made available to a select few customers participating in the Early Adopter Program already in July. For 33% off the final price, you will be given the opportunity to provide suggestions on Place & Play’s features, having your say in how the final solution turns out. By participating in the Place & Play Early Adopter Program (EAP) you will play a pivotal role in defining the device’s final functionality and design. The input of the companies and individuals using our technology has time and again proved an essential part of Visionect product development, resulting in signage solutions that are exactly tailored to user needs. For 33% off the final price, a limited number of users will be given the opportunity to provide suggestions on Place & Play’s features, having your say in how the final solution turns out. You’ll also benefit from a dedicated Visionect expert to assist throughout all the stages of the EAP. All we ask in exchange is input and feedback on product functionality, your endorsement as a Place & Play EAP participant, and the approval to add your name and logo to our customer reference list. Join the thousands of companies such as Microsoft, Samsung, Sony, Cisco, Virgin and Dell that are already helping us power a new era of innovation. Join the Early Adopter Program and be the first to try Place & Play, provide product suggestions and shape the final sign functionality. Find out more about the EAP and sign up to participate here.